Later this month, IC Insights will release its May Update to the 2017 McClean Report. This update includes a discussion of the 1Q17 semiconductor industry market results, an update of the capital spending forecast by company, a review of the IC market by electronic system type, and a look at the top 25 1Q17 semiconductor suppliers (the top ten 1Q17 semiconductor suppliers are covered in this research bulletin). The top ten worldwide semiconductor (IC and OSD - optoelectronic, sensor, and discrete) sales ranking for 1Q17 is shown in Figure 1. It includes four suppliers headquartered in the US, two in Europe, two in South Korea, and one each in Singapore and Japan. In total, the top ten semiconductor suppliers represented 56% of the 1Q17 worldwide semiconductor market of $99.6bn (2Q17 is forecast to be the first ever quarterly semiconductor market to exceed $100bn). Intel held a slim four percent lead over Samsung for the number one position in 1Q17. However, as reported in an earlier IC Insights’ Research Bulletin, Samsung is on pace to displace Intel as the world’s largest semiconductor supplier in 2Q17. Memory giants SK Hynix and Micron made the biggest moves in the 1Q17 ranking as compared to the full year 2016 ranking. Spurred by the recent surge in the DRAM and NAND flash markets, each company moved up two spots in the top ten ranking with SK Hynix now occupying the third position and Micron moving up to fourth. There was one new entrant into the top ten ranking in 1Q17 - Germany-headquartered Infineon. The company’s 1Q17/1Q16 sales increase was six percent. Infineon replaced fabless supplier MediaTek, whose 1Q17/1Q16 sales were up by seven percent to $1.8bn but the company suffered a sequential 1Q17/4Q16 sales decline of 17%. Half of the top ten companies had sales of at least $4.0bn in 1Q17. As shown, it took $1.9bn in quarterly sales just to make it into the 1Q17 top ten semiconductor supplier list. 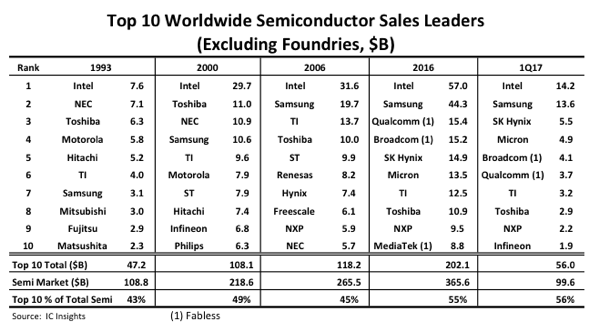 As would be expected, given the possible acquisitions and mergers that could/will occur this year (e.g, Qualcomm/NXP), as well as any new ones that may develop, the top ten semiconductor ranking is likely to undergo some significant changes over the next few years as the semiconductor industry continues along its path to maturity.